Sarah Crichton Books, 9780374280918, 304pp. At a time when we are all more rudderless than ever, we look for the very best teachers and mentors to guide us. In Fully Alive, an unusual and gripping memoir, Timothy Shriver shows how his teachers have been the world's most forgotten minority: people with intellectual disabilities. In these pages we meet the individuals who helped him come of age and find a deeper and more meaningful way to see the world. Shriver's journey begins close to home, where the quiet legacy of his aunt Rosemary, a Kennedy whose intellectual disability kept her far from the limelight, inspired his family to devote their careers to helping the most vulnerable. He plays alongside the children of Camp Shriver, his mother's revolutionary project, which provided a space for children with intellectual disabilities to play, and years later he gains invaluable wisdom from the incredible athletes he befriends as chairman of the organization it inspired, Special Olympics. Through these experiences and encounters with scholars, spiritual masters, and political icons such as Nelson Mandela, Shriver learns how to find humility and speak openly of vulnerability and faith. Fully Alive is both a moving personal journey and a meditation on some of the greatest wisdom and the greatest contradictions of our society. Is disability to be feared or welcomed, pitied or purged? Shriver argues that we all have different abilities and challenges we should embrace. Here we see how those who appear powerless have turned this seeming shortcoming into a power of their own, and we learn that we are all totally vulnerable and valuable at the same time. 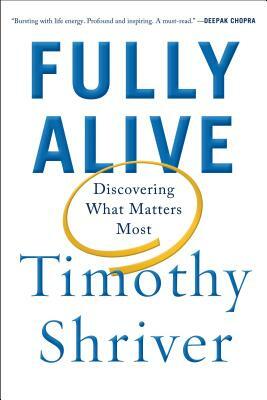 Timothy Shriver is a social leader, educator, activist, film producer, and business entrepreneur. He is the third child of Eunice Shriver, founder of the Special Olympics. As chairman of the Special Olympics, he serves more than three million athletes in 180 countries. He cofounded and currently chairs the Collaborative for Academic, Social, and Emotional Learning (CASEL), the leading research organization in the United States in the field of social and emotional learning. Shriver earned his undergraduate degree from Yale University, a master's degree from Catholic University, and a doctorate in education from the University of Connecticut. He lives in Maryland with his wife and five children.